If you right-click an entry in the playlist, you'll get a context menu with various options. Play obviously plays the file. Write to disk applies to network streams only, and writes the original stream data to disk (very nice if you'd like to record an online radio show). If the stream contains title updates, you can choose to write an additional CUE file containing the titles, or to split the audio file into separate tracks with the titles as filenames. (Note that the title updates are not perfectly positioned in respect to the music, that's inherent to streaming. This means the track split may occur some seconds too early or too late.) Queue and Dequeue add or remove a file to or from the queue. Queueing a file will make sure it is the next file to be played, even if XMPlay is in random mode. Skip tells XMPlay not to play this track unless you double-click on it, and the entry will be grayed out in the playlist. Add to library simply adds the selected file(s) to the library. Locate in library selects all files in the library with for example the same artist or from the same album. (Read more about the library on the Library page). Rating gives you the ability to set a rating to a file, which makes finding your favourite tracks easier. 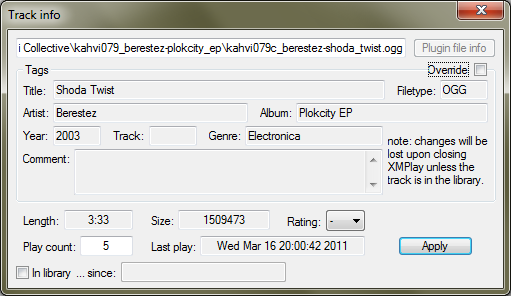 Track Info opens a window with the tag information XMPlay has about a track. You can override the tags without changing the file by ticking Override. If the file is not in the library, XMPlay will forget the changes you made when it is closed. 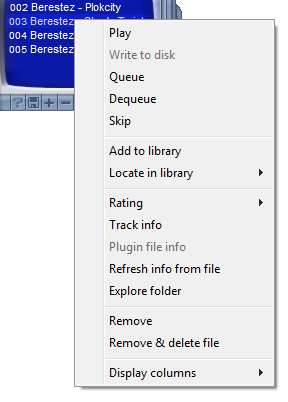 Going back to the context menu, Plugin file info opens the file info window of the input plugin used for this file, or of the tag writing plugin if applicable. Refresh info from file re-reads the tags of the file and rebuilds the formatted title. Explore folder opens the directory the file is in in Explorer. Remove removes the file from the playlist, Remove & delete file also deletes the file from the harddisk (to the Recycle Bin). Finally, Display columns actually applies to the playlist, not to the selected track, and allows you to select which colums should be shown (entry number, filetype, length and rating are available). The title of the track is always visible.